Warmer weather is upon us. HOORAY!! This weekend is suppose to be sunny and into the 60&apos;s so if you still got the ice fishing itch you better scratch it pretty quick. I&apos;m thinking we got another 2 weeks or less left of ice before we got open water. I just looked at the forecast and there aren&apos;t even any nights that will get below 32 and there&apos;s a lot of rain predicted. Maybe for the first time in a few years we&apos;ll have some open water a week or so before the Opener. I&apos;m good with that. There haven&apos;t been very many folks out there fishing lately. 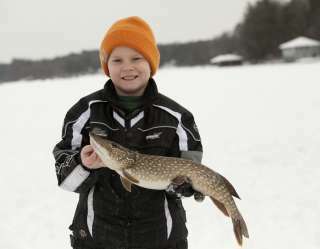 We are in the &apos;only the diehard&apos; times of ice fishing. But there is still plenty of ice but a lot of shore lines have pulled away, a long way in some cases. As always the north ends warm up first so please be careful. For those that have been out, the fishing has been very good. Lots of nice crappie, gills and perch are being taken in a myriad of ways. Not a lot of minnows going out the bait shop door. Mostly plastics, spikes, waxies, mousees and chena bait. And it seems that every fisherman has their own way of icing fish, and it&apos;s the only way that works. Always puts a smile on my face when 5 different guys come in and tell me that and they all fish a different way. And you know what? They are all right.